Apple has officially filed a motion mentioning 5 alleged patent infringements by Samsung Galaxy S4 and another 2 Siri related patents infringed by the device’s Google Now voice controlled search feature. I got to know that Apple ascertained that Samsung’s Galaxy S4 practices many of the same claims already asserted by Apple, and that it practices those claims in the same way as the already-accused Samsung devices. Interestingly, Apple’s motion does NOT mention the Galaxy S4 Google Edition, which Google announced at last week’s Google I/O developer conference. This entry was posted in Random Thoughts and tagged apple, google now, motion, patent infringement, samsung galaxy s4, siri on May 22, 2013 by Rakesh Patel. 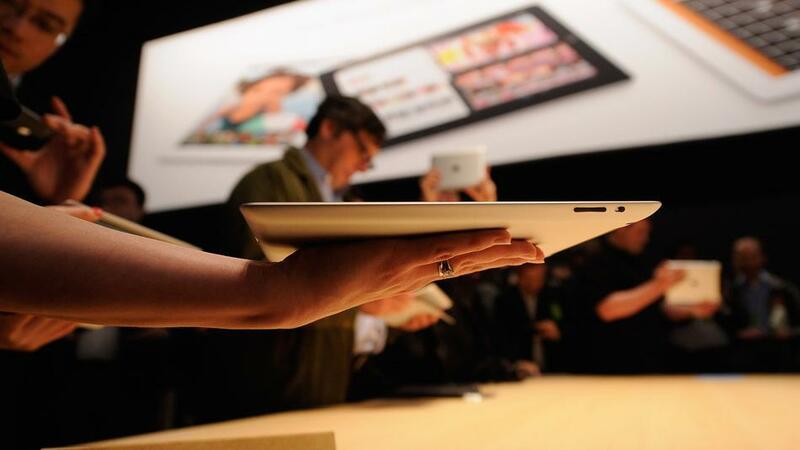 iPad 5 could weigh 33% lesser – no not on your pockets but in your hands. I’ve read various rumor reports claiming Apple’s fifth-generation iPad super skinny weighing less than a pound (around 0.66 pounds to be specific). Also the awaited iPad 5 will hit the mass production in July and launch “as soon as September,” if we follow the word from the supply chain sources. What’s more in the iPad 5? Amazingly, the new tablet’s touch panel may change up a bit with (Film on Glass) GF2 bonding that has one layer of glass and two layers of ITO film, instead of iPad 4′s G/G (Glass on Glass) bonding. But that’s not all that Apple is upto, there is more that you must check out here. This entry was posted in Random Thoughts and tagged film on glass, gf2 bonding, gg bonding, glass on glass, ipad 4, ipad 5, ipad fifth-generation on May 21, 2013 by Rakesh Patel. I think speculations about Yahoo thinking on acquiring Tumblr which have been centre of attention of late, are not wrong. Though there are no official declarations or statements made, Yahoo does signifies something with its press conference message in the invite “Join us as we share something special”. The press event is supposed to be held today, i.e. Monday, May 20th, 2013 in New York where Marissa Mayer is expected to speak, as reported by CNBC. Now, I’m wondering, can it be a sheer coincidence that Tumblr is also headquarted in New York? Also, why would Wall Street Journal report on its site about Yahoo board approving $1.1 billion for Tumblr acquisition? This entry was posted in Random Thoughts and tagged cnbc, marissa mayer, something special to share, tumblr acquisition, wall street journal, yahoo on May 20, 2013 by Rakesh Patel. This entry was posted in Random Thoughts and tagged 1st iphone, apple, intel chips, paul otellini, samsung on May 18, 2013 by Rakesh Patel. Time’s Changing with SmartWatch, Are You? After SmartPhone it is actually the time for SmartWatch App Development. And with this, I’ve gotten the answer of my question – if 2013, A Year to Watch or Ear to Watch? Pebble, a customizable, Bluetooth-enabled SmartWatch that connects to iPhone and Android smartphones already became the most highly funded KickStarter project to date with $10,266,844 pledged by 68,928 people. And now the company has announced the release of an updated Software Development Kit (SDK) called PebbleKit and APIs that will allow iOS and Android developers to create watch apps and watchfaces. This means the wearable computing device gives us the ability to do more meaningful things with the customized watch. This entry was posted in Random Thoughts and tagged create watch apps, pebble, pebblekit, smartphone, smartwatch, smartwatch app development, watchfaces on May 17, 2013 by Rakesh Patel. Apple App Store’s 50 Billion App Downloads – What’s in it for You? Needless to say that Apple’s App Market is growing by leaps and bounds. 50 Billion App Downloads in just 5 years is quite a remarkable stat. I did a little math, to evaluate the measure of the achievement and was astonished to find how big is the Apple App Market. 50 Billion App Downloads in 5 Years (approx. 1825 Days), it equals to an average of more than 27 Million App Downloads a day. Wow, that’s quite a figure! In fact a delighting one, not only for Apple but also for others (like App Developers, Sellers, Publishers, etc.) who are associated with the Promising, Popular And Profitable Market. One (1) First Prize Winner will receive one (1) Gift Card for credit in an amount equal to USD $10,000, and fifty (50) Additional Prize Winners will each receive one (1) Gift Card for credit in an amount equal to USD $500, redeemable in the iTunes Store, App Store, and iBookstore, as available in the country in which the applicable winner is located. PRIZE, for the people (app users) who are behind the growth. This entry was posted in Random Thoughts and tagged 50 billion app downloads, app market, apple, apple app store on May 16, 2013 by Rakesh Patel. Is Apple’s Motive Automotive with iOS 7? Lately I’ve got a lot to read about the various speculations related to iOS 7. Among all, one guess is about Apple shifting gear from Mobile to Motor meaning with iOS 7, Apple plans to move into the in-car integration space later this year. Now I believe there’s a high chance that Apple’s Siri can be your new Chauffeur. This is because right now Siri is available in Beta only and the company’s intention to take it to the next level is quite apparent with Apple already working with car manufacturers to integrate Siri into select voice control systems. There’s also a speculation that an iPhone could be plugged into a car and an optimized, redesigned version of Apple Maps will appear on the car’s built-in display instead of a proprietary GPS system found in many cars. Even this could be true because Apple itself hints on its website that Siri can be used to control the Maps functions and other iOS features. I’m also very inquisitive about the WWDC which is to be held very soon because you never know if Apple’s planning to launch this new in-car integration at this, or other upcoming events. This entry was posted in Random Thoughts and tagged apple maps, apple siri, ios 7, wwdc on May 14, 2013 by Rakesh Patel. Have you got your Apple ID Verified? Apple is rolling out its new two-step verification feature for Apple IDs to users in additional countries other than U.S., UK, Australia, Ireland, and New Zealand, who were initially availed with optional security feature when it was first launched in late March 2013 after a major security hole was discovered in Apple’s account management. Users from Canada, Argentina, Netherlands, Russia, Austria, Poland, Brazil, Mexico and other countries can check to exercise their option to verify one of their iOS devices as a “trusted device” in order to receive a verification code to access their Apple ID. You will first have to check on the availability of the option which automatically appears in the Password and Security section of Manage My Apple ID when You sign in to My Apple ID. If you are a user from U.S., UK, Australia, Ireland or New Zealand, you can choose an SMS-capable phone number to receive text messages with the temporary verification codes Apple uses to verify your identity. While if you are a user from other country then you will have to verify one of your iOS devices as a “trusted device” in order to receive a verification code through the “Find My iPhone app” and access your Apple ID. Lets be Safe than Sorry and get our Apple IDs verified. Apple also offers the required support related to FAQs about two-step verification for Apple ID. This entry was posted in Random Thoughts and tagged my apple id, trusted device, two-step verification for apple id on May 11, 2013 by Rakesh Patel.